Haskell provides a great way to perform combinatorial searching with backtracking: the list monad. Do-notation provides a nice DSL that makes it easy to express the trying out of different possibilities. But the list monad only performs a simple-minded walk through all of the alternatives giving little opportunity to direct that walk. In particular, it's not easy to provide heuristics to say things like "try this alternative first but if it starts going badly consider this alternative too". This post contains a monad that gives a simple scheme to allow programmers to direct searches in this way. When using the list monad, a list is interpreted as a list of candidates in a search. The join function for this monad takes a list of lists of candidates and flattens it into a list of candidates. This is all the list monad really does: you write code that generates new candidates from old, and the >>= function applies this code to all of the candidates it knows about and then flattens this back out to a single list of candidates. Importantly it does this in a lazy way so that you only need look at candidates as they are generated. This new monad will keep slightly more information: each candidate will have a 'penalty' value attached to it saying how attractive a candidate it is. Candidates with score 0 will be tried first, and those with score n will be tried after those with lower scores. We can represent a collection of candidates and their scores simply as a list of lists. The first list in the list will have those with score 0, the second will have those with score 1 and so on. We'll call these lists penalty lists and the positions within those lists slots. The rule we'll adopt is that if you're trying a combination of two candidates then the penalty associated with the combination is the sum of the penalties of the individual objects. To implement this we need an alternative version of the join operation. If we have a penalty list of penalty lists and we have an element in the mth slot in the nth penalty sublist then we want it to end up in the (m+n)th slot in the final penalty list. Within a slot we can just order the elements just like in the original list monad. 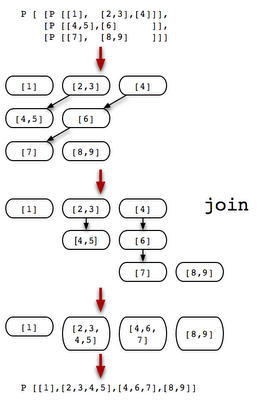 Explaining how join is implemented would take many words so I hope this picture of the computation of an example will do instead. I used the Monoid class simply to avoid directly referring to one level of nesting of brackets. It is intended to be a proper implementation of a Monad satisfying the three monad laws but I haven't proved this and it's possible that it occasionally leaves trailing empty lists around - which have no impact on search results. We can use this much like the list monad. First it will search for possibilities with zero penalty. When these are exhausted it'll backtrack to the last place where it can start finding possibilities with penalty 1. Then it'll try penalty 2 and so on. Importantly it manages to do this lazily so that we don't explore penalty n+1 until we've finished penalty n.
Of course we wouldn't really search for Pythagorean triples this way. This is just an illustration of how to use the code. But note, crucially, that the equivalent code using the regular list monad would give us back no solutions. It'd start with x=1 and y=1 and then go off to infinity finding candidates for z. So as a side effect the penalty list allows us to tame some infinite searches. Anyway, that was a simple numerical example. But this monad can be used with much more complex kinds of search. In fact it almost serves as a drop-in replacement for the list monad. This is a really nice example of the way separation of concerns is easy in Haskell. The task of generating candidates for search can easily be separated from the task of selecting from those candidates, even though the operations are highly interleaved during execution. So here's a more complex example: writing a parser that can tolerate errors without running into combinatorial explosion. The idea is that we associate a penalty with each error. The penalty will make the parser run on the assumption of no errors until it can no longer parse, and then it'll backtrack on the assumption of one error until that assumption is no longer tenable and so on. We can liberally sprinkle 'erroneous' parsings throughout our code confident that these branches will only be taken in the event that an error-free parsing can't be found. Firstly, here's a penalty list that we can use to introduce a penalty of just 1. If we stick that in the code path then anything following acquires a penalty of 1. We could have parameterised that with the underlying monad so that we could have parsers with a choice of search strategy. 2. parentheses are occasionally left out by the clumsy user. > ex2 = parse completeExpr "2^(1+3"
When we run this we get no error-free parsing but we do get 3 readings with one error. One comes from reading the '(' as 9, one comes from inserting the missing ')' at the end and one comes from inserting ')' after '1'. Note that even for complex expressions we'll quickly find a 1- or 2-error parsing. For the regular list monad we might never get a parsing because there are an infinite number of ways of inserting parentheses. Anyway, that was just a toy parsing problem. But a more complex application comes to my mind. Some written languages are tricky to parse because their orthography doesn't fully capture the phonetics of the original language, because there are few or no indicators of sentence or even word breaks, and because they have numerous optional orthographic and grammatical rules and use a script whose individual characters are occasionally hard to reliably identify. In such a situation it's good to have a parser driven by heuristics about what is likely to be intended and the penalty list monad might serve well. Here's an example of such a language. PList is a variation of the convolution monad I described here. It deals with the "wrong category" aspect so it is a true Haskell monad. Penalty lists form some kind of dual to the convolution comonad. It has much in common with this monad. That monad doesn't do anything smart about ordering searches but it does have the neat ability to 'fuse' different branches of a search so that different ways to arrive at the same place don't add to the combinatorial explosion. It's good for searches where you want to know what the minimum penalty is to get somewhere, but don't care what the best path actually is. Also, in response to a comment on #haskell I've made the join example more complex so it's easier to generalise from it. I think, the PList monad is almost the same as the implementation of breadth-first search by Mike Spivey in his chapter in "The Fun of Programming" or his paper Algebras for combinatorial search. Your join function performs diagonalisation and Spivey uses the function wrap instead of penalty wich has a slightly different interface but both are inter-definable. Also, I think if you use a continuation monad as in Reinventing Haskell backtracking you don't need to implement the complex diagonalisation function. What a neat idea! I can immediately see an application for computer aided learning. Computer aided learning of foreign languages is great for drills and repetition, but giving constructive feedback to free-form responses is much harder. For simple grammar exercises, this parser could really help. Sebastian, thanks for the links. The 'diagonalisation' function was my starting point. I realised it made sense from an algebraic perspective a long time ago but it only dawned on me a couple of days ago that it orders searches. (It's a weird kind of convolution.) So I'm definitely interested in Spivey's paper as it also looks quite algebraic. I've just wasted an afternoon trying to shoehorn this into breaking simple substitution ciphers. The theory I was going on is that if you sort the alphabet of the ciphertext into order of frequency, then it should closely correspond to the English (or whatever language) alphabet sorted into order of frequency. You can then try matching up permutations, trying the "closer" permutations first. Neat idea. Penalty lists work better when you don't have to stray too far from penalty zero, otherwise you'll still get combinatorial explosion. I'm not sure you can ensure that here.